Personal Account Representative – Sherman has implemented a unique concierge-style account management system. Your dedicated account representative understands and continually analyzes your purchasing patterns and will provide you with new item suggestions. Pricing – All of our items are available at wholesale cost, saving you hundreds, even thousands of dollars over retail stores, websites, and distributors. 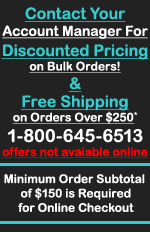 Shipping – We offer free ground shipping on orders over $250. This is not a promotion, but our standard business practice. Zero Hassle Returns –We arrange for the package to be picked up at your location, and sent back to us. We NEVER charge a restock fee. Promotional Division – Besides our great party favors, we also have a division focused solely on promotional and marketing products at a fraction of the distributor cost because we are the wholesaler. Call your Sherman Specialty representative today to learn more about our product line and unique approach to service!